- Date: 08/2016, Seed: $750 k (post valuation: undisclosed amount). - Date: 06/2016, Seed: $1.25 M (post valuation: undisclosed amount). - Date: 01/2016, Seed: $500 k (post valuation: undisclosed amount). OPER (Order. Pay. Earn. Redeem) is on a mission. We’re trying to help rid the world of credit card fees. You see, when you use your AMEX to pay for gas, swipe for your lunch at the corner deli or pay with your MasterCard at the local barber, those businesses aren’t getting 100% of what you’re paying. Credit card companies are taking anywhere from 2-5% of those sales. And for what? So you can swipe a piece of plastic? 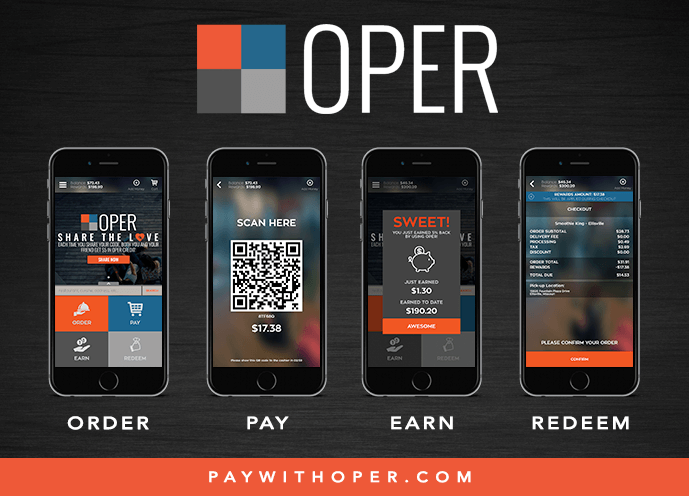 OPER is the first mobile payment of it's kind offering free transactions to merchants. No more credit card fees, commissions, or monthly fees. For users - earn 10% back on every purchase into one central rewards account. 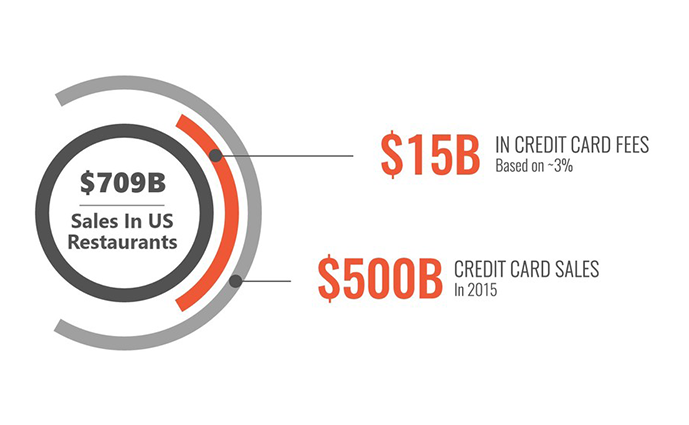 Last year alone, $180 Billion dollars in the US and $480 Billion dollars worldwide was spent in credit card processing to Mastercard, Visa, American Express and Discover. Most of these fees were paid by small businesses, cutting into their already-dwindling profits and often forcing them to raise prices to try and offset these costs. And instead of these fees decreasing over time, large companies like Amazon, ApplePay, and Square are making it easier for consumers to use their credit cards. Small businesses regularly pay fees in the range of 2.5-5% of each credit card transaction. These fees are charged to the business and generally split between merchant service providers, like FirstData & National Bankcard, credit card issuing banks, like Citi & Chase, and credit card associations, like Visa & MasterCard (source: ValuePenguin.com). They include terminal fees, payment gateway fees, PCI fees, annual fees, monthly fees, statement fees, network fees and IRS report fees (source: merchantmaverick.com). Sound complicated and expensive? It is and that’s why this needs to change! 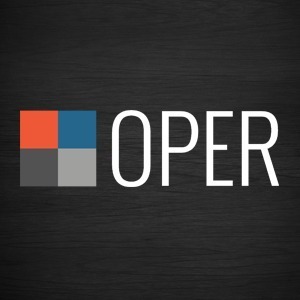 While every other company approaches businesses with options to pay for their service to either 1) increase business or 2) make business more efficient and in theory, save money, OPER is actually FREE and helps businesses save money on their loyal customers. By removing the credit card fees, we give businesses an immediate solution to help save money on their existing business. We built a payment platform to integrate with the existing ecosystem. From dining to retail to enterprise, OPER was built to give free payment to all businesses and if scaled correctly will be the next Mastercard. To gain initial traction, we thought we’d start with restaurants. They have some of the tightest margins in business today and people eat 3 times a day, 7 days a week. This combination provided a great opportunity to save these businesses significant dollars while also allowing us to capitalize on a habitual consumer behavior – dining out. By eliminating credit card fees, we give businesses an immediate solution to help save money and grow. We are raising funds to accelerate our fight against credit card fees. We’re excited to show you how this is possible! Click here to join our mission! An experienced entrepreneur with deep industry experience in online commerce, food transactions, and market expansion. David has sold 3 different companies within the food commerce space. Scott has 15+ years of marketing experience. From managing agency clients to developing & implementing a marketing strategy for a top Domino’s franchise & tech start-up, Scott offers a broad insight into the world of marketing & advertising. 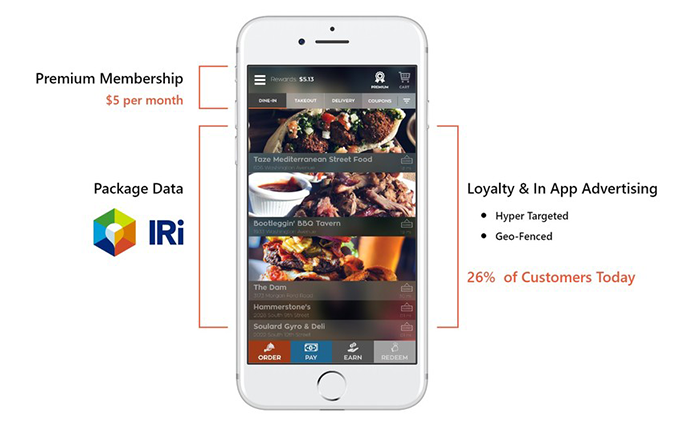 We are a data company scaling as a consumer facing payment app. 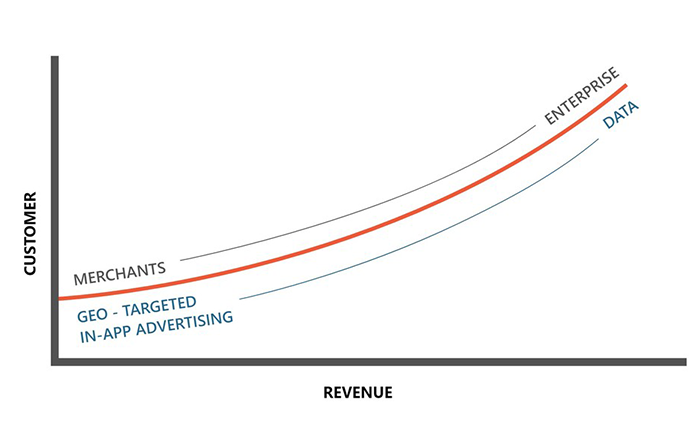 By offering free transactions and hyper targeted geo fenced advertising to our customers, we can scale our business profitably while we develop our data packaging to be sold into enterprise chains as well as other large corporations in need of offline transaction level data. To merchants/restaurants, we offer free credit card processing (first mover). To users, we offer a non-conflicting 5% dining cash back reward (highest cumulative reward platform).